The Christian religion is one of the most popular religions on the planet and churches are springing up on daily basis. number of churches and one with one of the highest devotes as well. Today, we take a look at 5 of the churches with the biggest church building/auditorium that can accommodate the most people. made this list or the ones who should’ve made it. Happy reading! It sits atop over 40,000 hectares of land and stretches as far as Sagamu, Ogun State. Its current worth is put at N200 billion. The Mountain of Fire and Miracles Ministries, (MFM) founded by Dr.
known as ‘Prayer City’, at Kilometre 1, Lagos Expressway, Ogun State. accommodate over 500,000 worshippers, with an overflow of 250,000.
International is one of the biggest churches in Nigeria today. The church which was founded by its presiding Bishop, David Oyedepo with headquarters in Ota, Ogun State, Nigeria. Guinness Book of Records, which has an overflow capacity of 250,000.
international headquarters of the ministry in Ota, a suburb of Lagos. country today having several millions of branches all over the country. 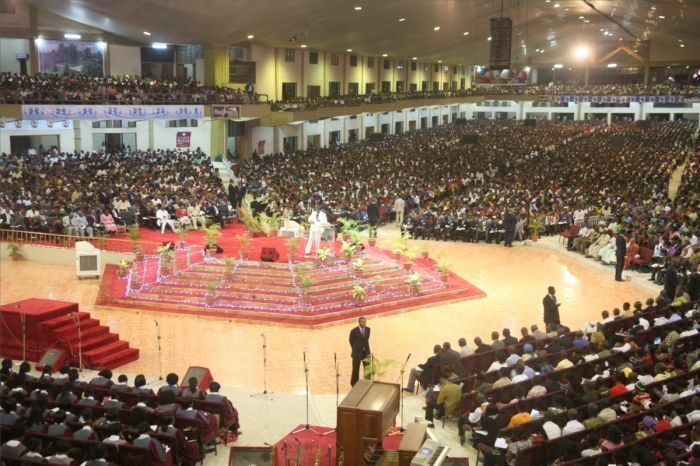 largest church in the world, was inaugurated in Lagos. University of Lagos, Akoka, Yaba, Lagos, has gone so big. The church boasts of an ultra modern headquarters in Gbagada, Lagos. D’Alberto, won the contract for the construction. underground car park that can take about 200 cars at once. Deeper Life also has a 240 hectare project off the Lagos-Ibadan Expressway, Olowosedo Village, Kilometer 42, Ogun State. supply system have been completed. underway and is nearing its completion. Training Centre (IBTC) at Ayobo, Lagos. iron beds, pillows and paint for church use.